As a part of the commemoration of International Yoga Day, Vivekananda Kendra Vedic Vision Foundation held 1) two Awareness Workshops on 18th June (Sunday), based on the Benefits of Yoga on, i) Diabetes and ii) Asthma. 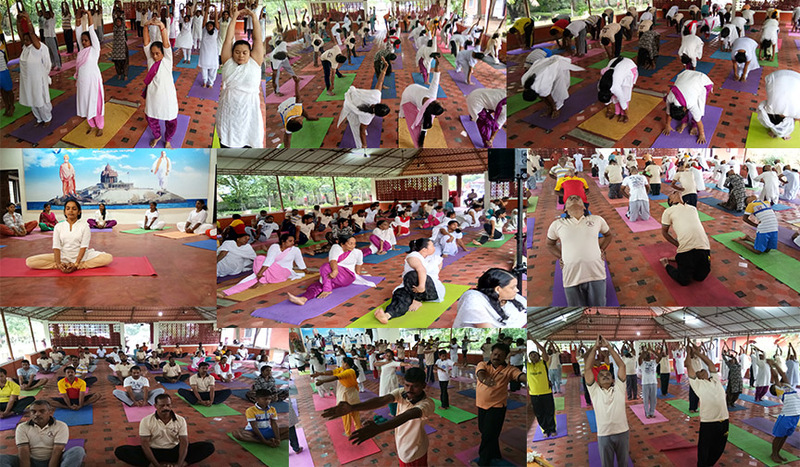 2) A yoga asana competition for three categories of students from 6 different schools of Kodungallur on 20th June, and 3) Mass yoga in the early morning of 21st June followed by the concluding function from 10 a.m to 12 noon. With the lighting of the lamp by Mananiya Lakshmi Didi, the first workshop began at 10.30 a.m. The topic was Diabetes, its cause and how yoga could help to control it. A popular Yoga practitioner from Chennai who had come on a visit to Anandadham was requested to conduct the workshop. It lasted for nearly two hours. He gave some important tips of how one should mold one's lifestyle in order to prevent such psychosomatic ailments like Diabetes. 20 people were benefited by the workshop. The second workshop started at 2.15p.m. The subject was Asthma, its preventions, and cure. Sri Sudhakarji conducted the class. An elaborate explanation of the yogic way of looking at the body, the reasons for 'vyadhi' or sickness and how yogic way of life and practice of some specific asanas and kriyas, could totally cure Asthma, was made clear through a power point presentation. The class concluded at 4 p.m.
75 students from 6 different schools viz, Amrita Vidyalaya, Gurushree Public School, HDPY Senior Sec.School, Shantiniketan International School and Bharatiya Vidya Bhavan of Irinjalakuda and Kodungallur, participated in yoga asana competition held in three categories- group A from classes III to V, group B from classes VI to VIII and group C from classes IX and X. The event started as early as 7.30 a.m. and concluded at 12 noon. It was an exposure for the students to understand their capacities and learn from the performance of the better performers. The International Yoga Day started with Deepa prajwalan and a few words of blessing by Mananiya Didi. 27 ladies and 23 gents participated in the mass yoga asana demonstration from 6.30 a.m. to 7.30 a.m.All of them were either yoga varga or yoga satra participants. 7 schools had invited karyakartas of VK Vedic Vision to talk on yoga and conduct a class for their students. 5 of our Yoga Varga lady karyakartas took the responsibility of visiting the schools. Su. Padmaja ( BSc Yoga from SVYASA) and Su. Pravitha(YIC from SVYASA) took classes in Phoenix Public School, Little Flower school, Seethi Sahib Memorial School and Sishu Vidya Poshini, Su. Sindhu (YIC from SVYASA) along with Sri Sudhakaranji -a sthanik varistha karyakarta, went to St Anne's Higher Sec School, Su. Sakeena Basheer(YIC from SVYASA) and Sri Sudhakaranji went to Bala Bodhini Govt U.P. School , Su. 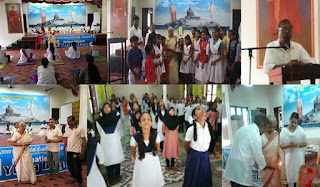 Cini (YIC from SVYASA) went to Al-Ameen School and Sri Sudhakarji, (jeevanvrathi) was invited to deliver the message of yoga in Paravur panchayat and MIIT School at Anjankadi. Su.Ranjitha ( Bsc Yoga, SVYASA) and Su.Lajitha who are yoga teachers in Sri Sai Vidya Bhavan and HDPY schools, Smt Jaya Radhakrishnan and Sri Harinathji - yoga teachers in Gurushree School and Bharatiya Vidya Bhavan, all of them whose initial training in yoga was in VK Vedic Vision, conducted the IYD programmes in their respective schools.Thus more 2000 students, teachers and common masses were approached in the process.